The Kooskia Internment Camp operated from 1943 until the end of World War II. It held more than 250 detainees, people of Japanese ancestry, and was about 150 miles southeast of Spokane. Priscilla Wegars of Moscow wrote “Imprisoned in Paradise: Japanese internee road workers at the World War II Kooskia Internment Camp” (Asian American Comparative Collection, University of Idaho, 2010). A brief trailer for the documentary film “Toraichi Kono: Living in Silence,” about Kooskia internee Toraichi Kono, a former employee of movie comedian Charlie Chaplin, is at www.youtube.com/watch?v=JrhqD0bwt0Y. Deep in the mountains outside Lewiston, Idaho, miles from the nearest town, exists evidence of a little-known portion of a shameful chapter of American history. 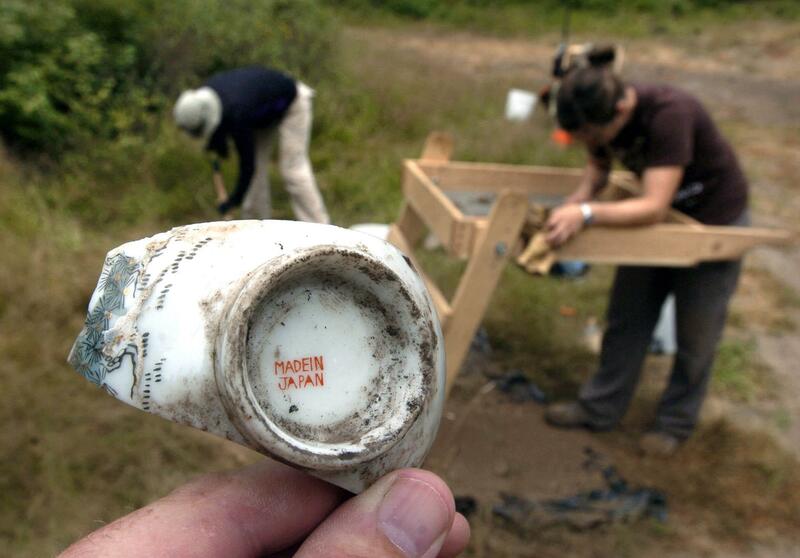 There are no buildings, signs or markers to indicate what happened at the site 73 years ago, but researchers sifting through the dirt have found broken porcelain, old medicine bottles and lost artwork identifying the location of the first internment camp where the U.S. government used people of Japanese ancestry as a workforce during World War II. A team of researchers from the University of Idaho wants to make sure the Kooskia Internment Camp isn’t forgotten. “We want people to know what happened, and make sure we don’t repeat the past,” said anthropology professor Stacey Camp, who is leading the research. It’s an important mission, said Charlene Mano-Shen of the Wing Luke Museum of the Asian Pacific American Experience in Seattle. After the surprise attack on Pearl Harbor plunged the nation into the second world war, about 120,000 people of Japanese heritage who lived on the West Coast were sent to internment camps. Nearly two-thirds were American citizens, and many were children. In many cases, people lost everything they had worked for in the U.S. and were sent to prison camps in remote locations with harsh climates. Research such as the archaeological work underway at Kooskia is vital to remembering what happened, said Janis Wong, director of communications for the Japanese American National Museum in Los Angeles. People need to be able “to physically see and visit the actual camp locations,” Wong said. Giant sites where thousands of people were held – such as Manzanar in California, Heart Mountain in Wyoming and Minidoka in Idaho – are well-known. But Camp said even many local residents knew little about the tiny Kooskia camp, which operated from 1943 to the end of the war and held more than 250 detainees about 30 miles east of its namesake small town, and about 150 miles southeast of Spokane. The camp was the first place where the government used detainees as a labor crew, putting them into service doing road work on U.S. Highway 12 through the area’s rugged mountains. “They built that highway,” Camp said of the road that links Lewiston and Missoula. Men from other camps volunteered to come to Kooskia because they wanted to stay busy and make a little money by working on the highway, Camp said. As a result, the population was all male, mostly recent immigrants from Japan who were not U.S. citizens, she said. Workers could earn about $50 to $60 a month for their labor, said Priscilla Wegars, of Moscow, who has written books about the Kooskia camp. After the war the camp was dismantled and largely forgotten. Using money from a series of grants, Camp in 2010 started the first archaeological work at the site. Some artifacts, such as broken china and buttons, were scattered on top of the ground, she said. “To find stuff on the surface that has not been looted is rare,” she said. Camp figures her work at the site could last another decade. Her team wants to create an accurate picture of the life of a detainee. She also wants to put up signs to show people where the internment camp was located. Artifacts found so far include Japanese porcelain trinkets, dental tools and gambling pieces, she said. They have also found works of art created by internees. “While it was a horrible experience, the people who lived in these camps resisted in interesting ways,” she said. “People in the camps figured out creative ways to get through this period of time.